The Georgia Guidestones, also known as American Stonehenge, have been a source of mystery, conspiracy theories and controversy since they were first erected in Elbert County GA in 1980. A man using the pseudonym Robert C. Christian commissioned them from the Elberton Granite Finishing Company. His anonymity continues to this day. The stones have been vandalized and restored on multiple occasions yet remain standing. Join us as we explore their mystery. 1 The controversial monument stands over 19 feet tall and weighs nearly 240,000 pounds. 2 The Georgia Guide Stones are have appeared on popular television shows, including Brad Metzer's Decoded and the Travel Channel's Mysteries at the Museum, a Monumental Mysteries Special. 3 The Georgia Guide Stones are maintained by Elberton Granite Association and sit on land owned by Elberton County. 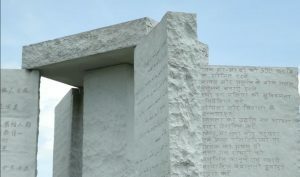 4 Eight different languages are represented on the stones, English, Russian, Hebrew, Spanish, Arabic, Swahili, Chinese and Hebrew. Visit the town square and dine at The White Plate for a great meal. We had lunch and can personally endorse the Grilled Cheddar Cheese Sandwich, Beef Tenderloin Burger and Poached Chicken Salad Sandwich. Each was mouthwateringly delicious and received rave reviews from our crew! Visit the Elberton Granite Museum at 1 Granite Plaza, Elberton GA. It displays a comprehensive history of the granite industry in Elberton, also known as The Granite Capital of the World. You can also see Dutchy, the Most Hated Statue, featured on an upcoming episode of Stories, Secrets & Sagas. Ever heard of Stonehenge? Strangely, Georgia has it’s own version just a short drive from Athens and they are called the Georgia Guide Stones. Completed in 1980, these large granite stones are engraved with ten guidelines in eight languages, meant to reestablish the planet and society if our world falls upon destruction and an apocalypse. According to the story, in 1979 a man using the pseudonym of Robert C. Christian approached the Elberton Granite Finishing Company and, with unlimited funds and a vision in mind, contracted their construction. Mr. Christian, he was an actual man. He did come to Elberton back in the late 70s, and this was his vision. This is what he wanted to build. And he came here with an idea, and he presented it to some granite manufacturers here and told them what he wanted. At first, they were somewhat skeptical of his design and of what he wanted. This is a very large monument and something much larger than what they were used to dealing with in the past. And, frankly, they didn’t really think that he was serious about it. But, he really was serious, and he did arrange for this monument to be sitting right here. 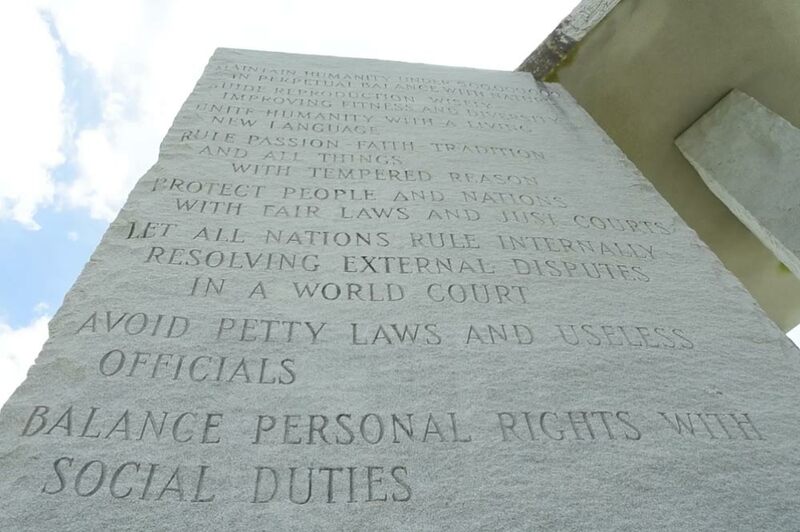 All we did as a granite industry was to provide the stone, the labor and the craftsmanship to get them done. 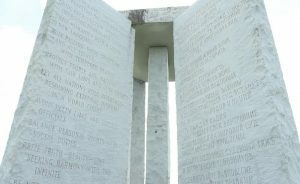 Over the years, the guide stones have been the focus of everything from conspiracy theories to that of satanic origin. And they have been vandalized and defaced on many occasions. There are many theories about why they were built. Being that these were constructed during the height of the cold war, they may very well have been created for the survivors of a World War III aftermath…as a reset for humanity. Another theory is that the guide stones were built by Freemasons. These stones sit nearby the town of Elberton, which was founded by Freemasons in a place where Pyramid Blue granite is in great supply. 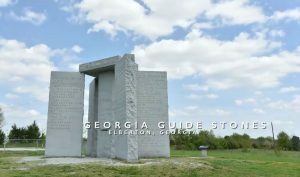 This is a unique place and definitely there are lots of questions and an ongoing mystery surrounding these Georgia guide stones. Just another Stories, Secrets & Sagas episode. Like this episode? Check out the Creepy Doll's Head Trail!